KATRINE GISLINGE, Danish pianist, has over the last three decades, established herself as one of Scandinavia's most significant pianists. Katrine Gislinge has played solo and chamber music concerts throughout most of Europe and the United States. She has worked with conductors and musicians like Gustavo Dudamel, Kurt Sanderling, Andreas Brantelid and Gidon Kremer, and she is a member of the Danish Pianotrio. She was the first Danish pianist to record for Deutsche Grammophon, and composers such as Per Nørgård and Bent Sørensen have dedicated works for her. Follow Katrine Gislinges concert schedule. This summer Katrine Gislinge plays 3 concerts in TIVOLI. Buy ticket for an exciting week in TIVOLI. A selection of Mozart piano concertos. Cadenzas by Bent Sørensen. 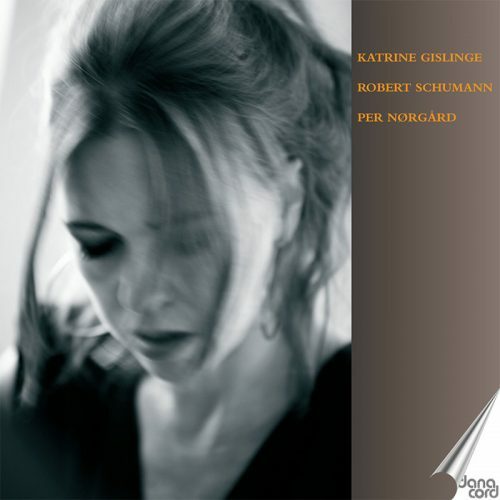 Schumann ‘Kreisleriana’ and piano works by Per Nørgård, including ‘Unfolding’, which the composer has dedicated to Katrine Gislinge. The booklet has a long interview with Per Nørgård and shows a painting by the famous artist Maja Lisa Engelhardt, who also made the cover of the CD. In the spring of 1781, having been booted out of Salzburg (much to his relief), Mozart arrived in Vienna. He was anxious to prove himself as a composer, but he supported himself as a performer. In a letter to his father he declared optimistically, “This is without doubt the land of the piano.” But unlike London and Paris, Vienna had no public concerts, much less independent orchestras, so when he turned his hand to piano concertos, Mozart presented them in subscription concerts with forces he organized. Another outlet was to publish three concertos—Nos. 11, 12, and 13—in chamber form. 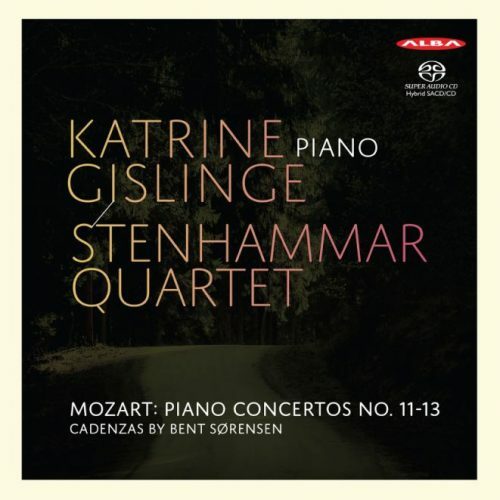 This project for selling sheet music to interested subscribers didn’t succeed, but the resulting arrangements a Quattro (with string quartet) afford us the delightful program on this current release featuring the excellent pianist Katrine Gislinge, the first Danish pianist to record for Deutsche Grammophon, and the accomplished Stenhammar Quartet, which was formed in 2002. The soloist and quartet are prominent in Scandinavian musical life, and both are dedicated to contemporary music, which they perform, commission, and record. In the past Jerry Dubins has been extremely enthusiastic about several releases from the Stenhammar Quartet, and although Gislinge has been reviewed only once in these pages, by Peter Burwasser (in 38:1), she won high praise for an album combining her passionate performance of Schumann’s Kreisleriana with music by the contemporary Danish composer Per Nørgård. The mixing of classical and contemporary becomes more intimate on the current release, because the cadenzas for the three Mozart concertos were freshly composed by Bent Sørensen, another important Danish composer who is also the pianist’s husband. When a Mozart piano concerto is reduced in scale without an orchestra, the solo part is brought into continuous prominence, and Gislinge proves to be a high-spirited Mozartean who keeps us engaged through her vibrant passagework and sensitive phrase-shaping. Since he was launching his first subscription concerts with these three works, Mozart wanted to impress the public with his brilliant piano playing. Gislinge is fully up to the challenge, and more importantly she captures the captivating, joyful spirit of these major-key scores. I’ll go so far as to say that I prefer her carefree, meticulously musical reading of K 415 to the account by Alfred Brendel and the Alban Berg Quartet (EMI/Warner). Where Brendel is studied, precise, and cool, Gislinge is unaffected and inviting. This is a quality in music-making that cannot be taught. Turning to the slow movement of K 415, the piano carries the moving line through passages where the strings drop out entirely, and here Gislinge effortlessly maintains a sense that the notes are flowing spontaneously. There’s purity in her approach, but she applies rubato sensitively to bring out touches of exquisite expressivity. The Stenhammar Quartet collaborates in the same spirit with spare, sensitive playing that doesn’t seek to inflate the orchestral part (which at this phase of Mozart’s concerto writing was relatively modest). A vivacious sense of animation pervades all three concertos with these performers, and it’s appealing that they don’t try to fit into Classical, Romantic, or HIP pigeonholes. About his approach to writing the cadenzas, Sørensen reveals that while he was composing his own music, he overheard Gislinge practicing Mozart in another room, and as phrases captured his attention, they became the seeds for where a cadenza might go. “One goal was that the cadenzas should fly out of Mozart’s music and into mine in a playfully virtuosic way.” I think the goal was achieved in a way that seamlessly merges the opening of each cadenza, which is recognizably Mozart, into Sørensen’s contemporary voice. Luciano Berio had a talent for overlaying his style atop Mahler’s or Schubert’s without distorting them, as if we heard both styles at the same time. Sørensen has the same knack, especially in the first-movement cadenzas, which are the longest, giving him extended space for inventiveness. At the same time he wanted to preserve “the buoyant lightness of Katrine’s Mozart playing,” and he has. Without detailing these performances, I want to praise how well the Stenhammar Quartet manages to make the accompaniments sound like true quartet performances filled with spontaneity and expression. In all, this is a highly recommendable disc, beautifully captured in SACD sound, which I heard in conventional stereo. Gislinge tapped the pained beauty of this music in a way it was hard to imagine any other pianist getting close to. Katrine Gislinges piano playing is full og fluency and sensitivity. Gave a rich performance of Chopins cello sonata with Andreas Brantelied, London City Festival. Sophisticated technique, emotional cunning and expressiveness … incomparably great pianist! Pianist finds secret entrances to beautiful parallel world – hyper sensitive! Katrine Gislinge’s new release on Danacord has forced me to remember that there can be more than one interpretation of any given work in my record library. This beautiful, intimate, rendering has allowed me to see the music in a different light. It has not displaced the Horowitz but it has enlarged my understanding of this complex sequence. Concerto for piano (cembalo), fl., ob., cl., vn. and vc. "Gislinge tapped the pained beauty of this music in a way it was hard to imagine any other pianist getting close to."